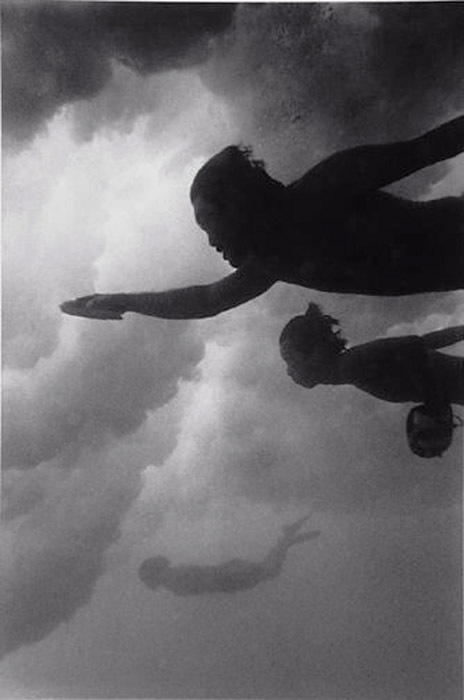 Of the many editorial decisions I made while putting together The Penguin Book of the Ocean, the one I’m proudest of was to include a series of Wayne Levin’s photographs. Anybody who’s seen the book will know how much they add to it, not just because they offer a stunning visual counterpoint to the written selections, but because they so eloquently distill the sense of the ocean’s mystery and beauty I wanted the book to evoke as a whole. I think – I hope – that the book is put together in such a way that every piece adds something essential, but I think there’s little doubt that if there was one selection the removal of which would drastically impoverish the whole, it’s Wayne’s photographs. I assume some readers will already be familiar with Wayne’s work. Although he’s less well-known in Australia than he is in the United States, his iconic images of swimmers and bodysurfers are both justly celebrated and immediately recognisable (and, I suspect, were at least partly responsible for inspiring Narelle Autio and Trent Parke’s equally iconic celebration of the Australian beach, The Seventh Wave). For my part, I first encountered Wayne’s work in 2005. I was working on a book about the Pacific (a project which, sadly, I later shelved) and as part of my background research had been reading Thomas Farber’s brilliant essays about water and the ocean, On Water (one of which also appears in The Penguin Book of the Ocean). Keen to read more of Tom’s work I went searching online, and in so doing stumbled on Wayne’s breathtaking 1997 book, Through a Liquid Mirror , which features an introduction by Tom. When my copy arrived I sat staring at it for hours. I quickly realised I’d seen some of the images of surfers before, but as I read on I found the real marvels were not those strange, perspectiveless images of humans in flight underwater, but the images of marine creatures: sharks, dolphins, fish, turtles, gliding weightlessly through the deep. In the weeks after that I bought and read Wayne’s similarly beautiful and deeply haunting collection of photographs of aquariums, Other Oceans , and found my way to his website, which collects many of the images from the books, both of which only added to my admiration for his work. One of the things I found most striking about Wayne’s images was his decision to work not in colour but in black and white. There’s no doubt one of the great revelations of the last decade or so has been the rapid advances in the documentation of marine environments, in particular the work of the BBC’s Natural History unit, whose efforts have led to the creation of documentaries such as The Blue Planet and Planet Earth. While these works have done much to change the way we see the oceans and their inhabitants, perhaps one of the most profound is the way they’ve taught us to see the marine environment as a place filled with colour, not just the reds and oranges of coral and tropical fish, but the deep, saturated blues and greens of the water, and the dazzling silvers and metallic glints of fish and light. 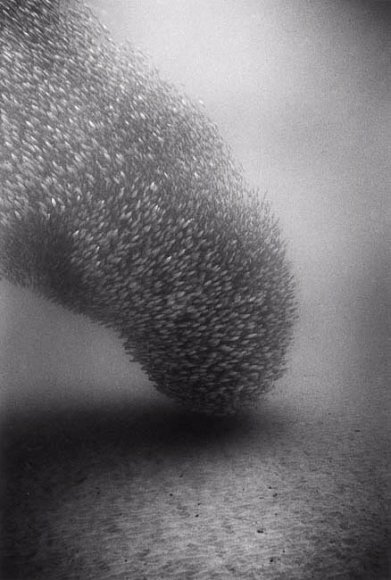 By contrast, by working in black and white, Wayne’s photos cleave to a more denuded palette, one comprised only of silvery greys and blacks, a decision that serves not just to sever their connection to more documentary forms of photography, but to demand the viewer see the subjects again, not as fish or swimmers or sea spume, but as things in themselves, wrapped in their own mystery and moving outside the bounds of language. Breaking waves become thunder clouds, suggesting how close swimming is to flight, sharks become sculptural objects, whales and dolphins loom out of the dark towards the light. 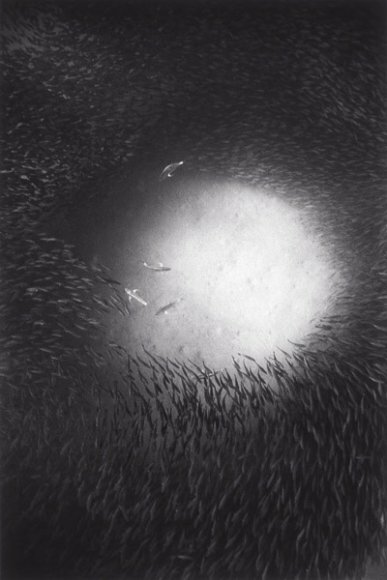 At its most effective, in images such as ‘Blue Trevally surrounded by Akule’, this transformation grants the subjects – and by extension the photographs themselves – a sacral quality, imbuing the scenes they depict with a mute power that conveys something essential about both the immensity and indifference of the ocean. Yet in many ways the best of Wayne’s images are those focussing on schooling Bigeye Scad, or Akule, as they are known in Hawaii. In these images the schools of fish become not just schools but living things in their own right, drifting and swirling like patterns of smoke or the Aurora, many minds in one body. Most of Wayne’s Akule photographs were taken across a three year period last decade, during which schools of Akule gathered in Kealakekua Bay on Hawaii’s Big Island (and the site of the fatal attack on Captain Cook), and Wayne took to swimming out in pursuit of them, oxygenating his lungs as he went in order to freedive ten, twelve, even eighteen metres down, to the edge of the light to capture the fish moving below. The best of these images, together with a selection of other images such as ‘Body Surfers, Makapu’u O’ahu 1983’ are collected together in Wayne’s new book, Akule , which was published late last year. Perhaps interestingly, it’s a smaller book than either Through a Liquid Mirror or Other Oceans, not just slimmer but more closely cropped. Yet somehow this reduction in size gives it an intimacy and simplicity many larger books lack. But its size also belies the wonder of many of the images it contains. 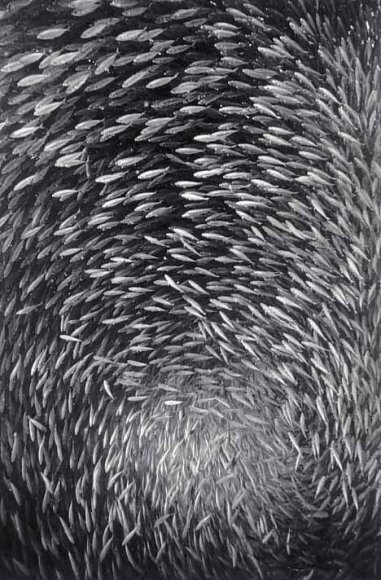 Here, again and again, schools of fish take on the wonder they possess in reality, becoming shifting things of light and silver, darting and turning, many minds in one body. 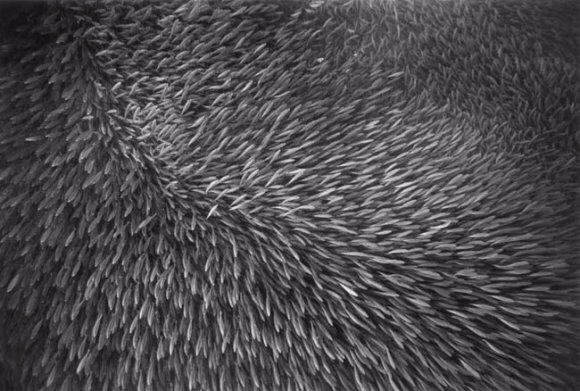 As Frank Stewart points out in his introduction to the book (the book also features a Foreword by Tom Farber), the seemingly purposeful of fish schools are relatively simple, and can, like many complex phenomena, be reproduced by the application of several simple rules, the same rules that create the unity of purpose exhibited by bird flocks (they also, suggestively, bear more than a passing resemblance to the Aboriginal artist, Gloria Petyarre’s Medicine Leaves paintings, which evoke the movement of grass and leaves in the wind). Stewart is wary of reading too much into the capacity of simple rules to generate complex behaviour, cautioning against the desire of some to see in it something essential we have previously only associated with living things. I share some of that wariness, though I’m perhaps less inclined than Stewart to dismiss the discoveries of those working in this area as simply the application of “our currently fashionable metaphor to explain the mystery of life”. Yet he’s right to point to the way many of the photographs in Akule ask us to reconsider our ideas about the boundaries of agency. It is impossible to look at photographs like ‘Column of Akule, Kealakekua Bay, Hawai’i 2000’ or ‘Flock of Akule, Keauhou Bay, Hawai’i 2006’ and not be aware of the way these twisting columns of bodies seem to have purpose and meaning of their own, or the manner in which their sense of order and movement seems to imply the presence of some kind of collective organism. This desire to expand the definition of life to include biological systems is central to much contemporary biological and environmental thinking. Yet it also demands we rethink our own relationship to the environment we inhabit, and the interconnected web of life that sustains it. Given the urgency of the environmental challenges we face, there is something both salutary and humbling in being confronted by work which, like Wayne’s photographs, demands we do precisely this. Because in the end that is what the photographs in Akule do. They ask us to look at the twisting, shifting, leaping columns of fish and see them as what they are: things pulsing with life, mysterious and Other, but living all the same. And, perhaps just as importantly, they demand we re-examine many of our assumptions about the creatures that surround us, by reminding us of how irrelevant we are to them, caught as they are in the business of their lives, and of how our knowledge of them will always be partial, fragmentary, constrained by the limitations of our imaginations and senses. Akule, Through a Liquid Mirror and Other Oceans are all available from Amazon. If you’d like to see more of Wayne’s work you can visit his website or download a preview of Akule. The Penguin Book of the Ocean is available in Australian bookstores or you can check prices at Booko. At some point I may talk more about my unfinished book about the Pacific but that’s very definitely a story for another day. A wonderful post, thank you! Levin’s work is mindblowing. The whales in the Penguin Book of the Ocean are my favourite. Levin’s passion for photography is evident from his work. A great post, i loved reading it. A WONDERFUL, WELL DESERVED TRIBUTE TO AN UNDERWATER ARTIST THAT TEACHES US THAT BLACK AND WHITE PHOTOGRAPHY HAS NOT DIMINISHED IN POWER. THIS “AKULE” HAS PHILOSOPHIC DEPTH IN SUBJECT AND VISUAL UNDERSTANDING OF GREAT ART. I have been in love with Wayne’s BW photo called Bodysurfer B-14. It reminds me of what a bodysurfer will experience when ascending into heaven to meet his Maker. I would like to purchase a copy for a gift for my husband. Please give me the name and address of whom I may contact to purchase a copy.